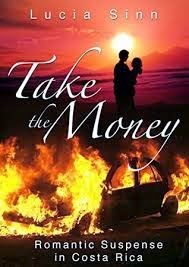 Lucia Sinn's "Take the Money" is a romantic suspense about a woman who mysteriously gets a large sum of money from her dying boss. The protagonist, Julie Lawson, takes the money and flees to Costa Rica, where, instead of finding safety like she expected, she finds a killer is chasing her. Sinn does a wonderful job of juggling the different elements of the plot without confusing the reader. Despite the fast pace of the plot, Sinn really develops Julie, so the reader gets invested in her. The secondary characters, from Dr. Enrique Rojas to Nellie Compton, do a great job of flavoring the story. If you like novels with action and romance and an exotic setting, you'll enjoy this book!